[prMac.com] Dnipro, Ukraine - Independent game developer, Absolutist is today proud to announce the global release and immediate availability of Sky Clash: Lords of Clans 3D of their steampunk-themed multiplayer strategy game for iPhone, iPad, iPod touch, and Android devices. While playing the game players will be forced to forge alliances, build and strengthen their base, and create an army as they defend against constant enemy attacks. Sky Clash offers players a huge steampunk-themed world which includes an immersive storyline populated by an intriguing cast of characters, offering unexpected plot twists and challenging side quests. The game is the first full 3D sky strategy game, offering a free-wheeling camera and photorealistic graphics. "Sky Clash's unique SkytoFly game universe has already lured and engaged over three million fans. Players are drawn in by the universe's steampunk action in a world of infinite sky and floating islands and flying ships," says Igor Chavychalov, the Senior Game Producer with Absolutist. "We aimed to create a world of endless wonder and challenge. And now, iOS players can now explore the challenge of the SkytoFly universe!" 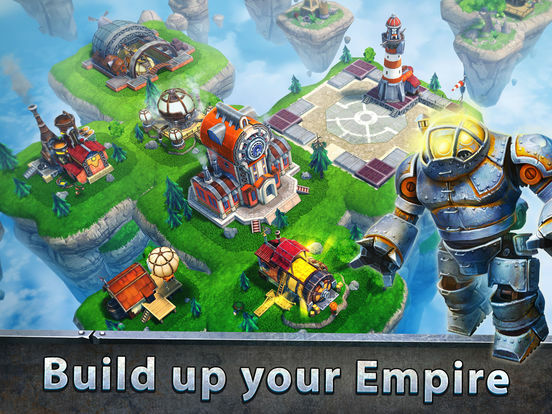 Players will be challenged by Sky Clash's huge open world, which was created with the Unity 3D engine. This allowed the developers to pay great attention to detail, bringing them the ability to create a challenging game on a level that many players have never experienced on their mobile device. Those players who are new to the SkytoFly game universe need not worry, as the game offers an excellent in-game tutorial that demonstrates the principles of the game, while at the same time offering immediate immersion into the game's strategic action. Players are immediately shown how to defend their base, while they are also shown how to wage their own attacks, proving the old adage that the best defense is a good offense. Players may quickly taste the sweet nectar of victory, but they will soon learn that an even deadlier challenge awaits them. Sky Clash: Lords of Clans 3D offers an unusual twist on multiplayer strategy games with its steampunk-themed action. Players are invited to download the game and take a closer look at the infinite challenge offered by the game. Sky Clash: Lords of Clans 3D 1.39 is free and is available worldwide through the App Store in the Games category. Convenient in-app purchases are available to in-game currency to help players advance through the game at a faster pace. An Android version is available through Google Play, while a Gameroom version of the game is also available. Absolutist is a developer and publisher of casual and mid-core games based in Dnipro, Ukraine. First founded in 2000, within a decade it grew into the largest casual game developer in Europe. The company has been involved in development and distribution of mobile, desktop games, Flash online games, and educational apps and interactive books for children. The company's primary focus has shifted to game publishing and licensing, and from casual to midcore mobile and social gaming. All Material and Software (C) 2017 Absolutist Ltd. All Rights Reserved. Apple, the Apple logo, iPhone, iPod and iPad are registered trademarks of Apple Inc. in the U.S. and/or other countries. Other trademarks and registered trademarks may be the property of their respective owners.